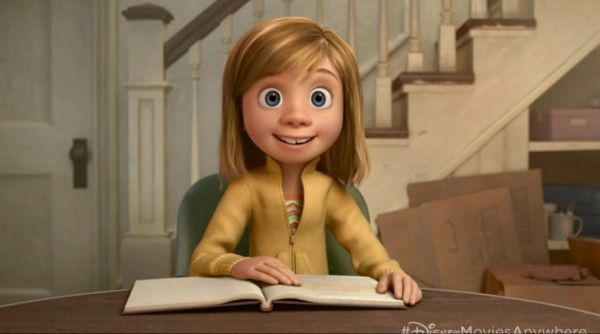 In Pixar’s upcoming film Inside Out, a group of emotions— Fear (Bill Hader), Sadness (Phyllis Smith), Joy (Amy Poehler), Disgust (Mindy Kaling) and Anger (Lewis Black)—guide the life of an 11-year-old girl, Riley Anderson. We previously saw the emotions, and now a brief featurette on Disney Movies Anywhere has provided the first look at Riley. As you’d expect, she’s an adorable little girl, but it’s important to remember she’s almost a supporting character in this story. The plot involves Riley moving to a new town and a new school, which forces Joy and Sadness away from the control panel and into the far, unfamiliar reaches of her mind. No disrespect to the studio’s recent movies, but Inside Out easily looks like one of Pixar’s most exciting projects in years. Hit the jump to see the first Inside Out image of Riley. The film opens June 19, 2015. Via Disney Movies Anywhere (you’ll have to register in order to watch the featurette) [via The Pixar Times].